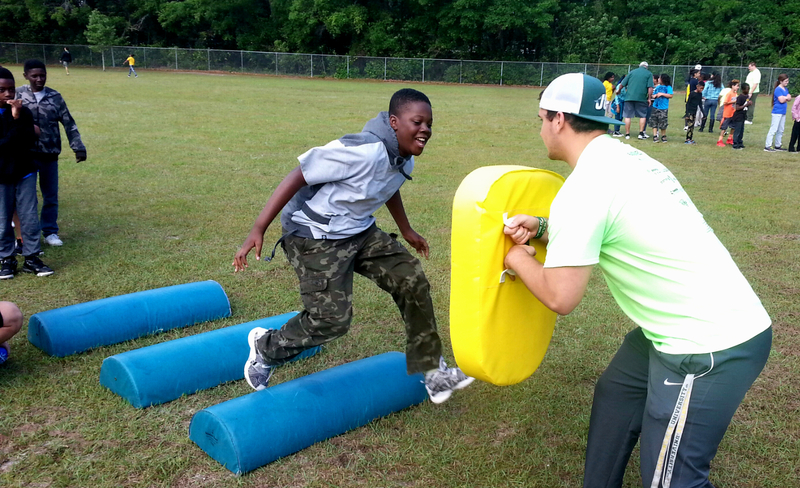 Arlington Heights Elementary School students race to their next drill at the JU football clinic with players and coaches held on Charter Day. 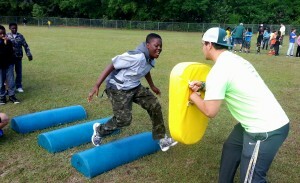 Football Head Coach Ian Shields works with a student at Arlington Heights Elementary School on Charter Day. 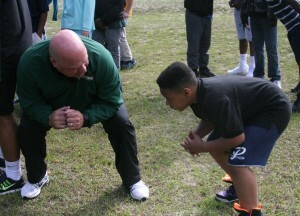 Football Head Coach Ian Shields, crouching down over and over again with a 10-year-old student at Arlington Heights Elementary School in an informal clinic, boosting his confidence to line up with just the right stance, while helping him in a broader sense to see “what right can look like” — all watched by a thrilled Phys. Ed. 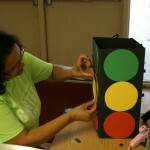 teacher Sharon Skipton. Sophomore Finance major Fred Blaz, 25, an Afghanistan War veteran, moving furniture at Five Star Veterans Center, enlivened and perhaps even a bit reassured as non-veteran students all around him helped out, improving the rooms and hallways of displaced veterans. Brigadier Gen. (Ret) Michael Fleming, Chief Government, Military and Community Relations Officer, still on the mend and just off crutches after major knee surgery, traveling to numerous volunteer sites throughout the morning, including at Five Star, where he explained JU’s indebtedness to Arlington to District Councilwoman Joyce Morgan and appreciative Five Star managers. 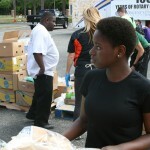 Accepted students get ready to help distribute food to the needy with partner Feeding Northeast Florida on Charter Day. 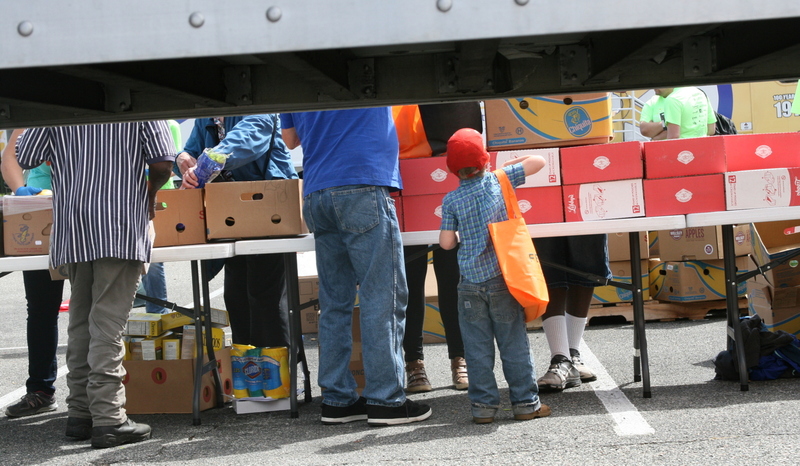 Residents of Arlington receive food distributions from Feeding Northeast Florida’s truck in the JU Gooding Building parking lot on Charter Day. 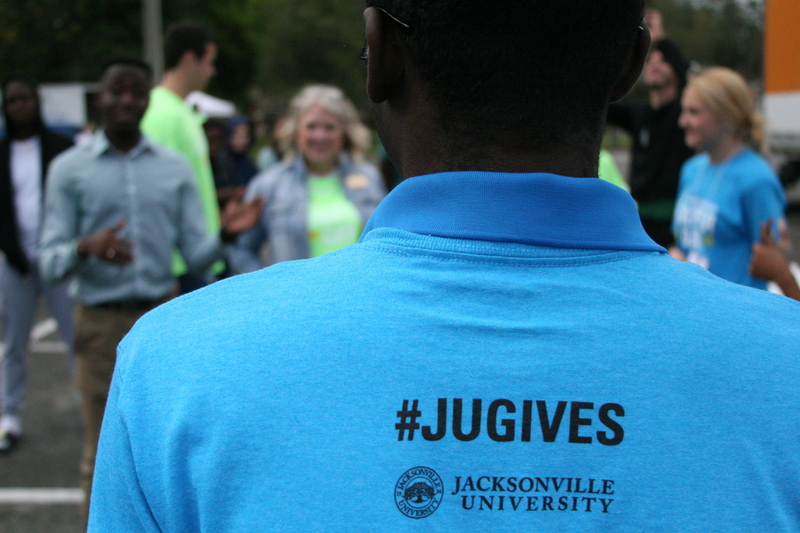 And while such waves of generosity may come and go quickly, the ripple effect is anything but fleeting — on the community or on JU and its students. Each action leaves behind another small chapter in the University’s unfolding story. The symbolic gestures that attract a day’s worth of attention can sometimes serve more enduring purposes than meet the eye. 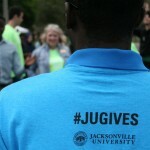 Project partners on the receiving end of JU’s largesse included Duval County Public Schools, Five Star Veterans Center, PACE Center for Girls, GRASP Academy, L’Arche Harbor House, the Daniel Home, the Sulzbacher Center and many more. Landscaping, decorating, painting, distributing food, cleaning, mentoring and coaching were just some of the acts of service to commemorate the University’s 82nd birthday and continue the outreach into Arlington that was accelerated when Cost took office in 2013. 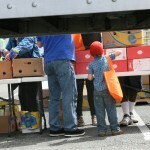 More than 1,000 volunteers signed up. 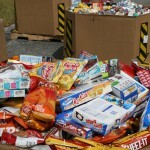 JU students, faculty and staff donated more than 1,000 pounds of food to Arlington Community Services. 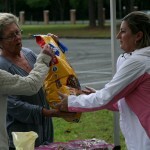 Volunteers baked more than 500 cookies for Veterans of the Five Star Veterans Center (project partners – Five Star Veterans Center, Highlands Presbyterian Church, Arlington Congregational Church, Southside Christian Church). By moving furniture and reorganizing, volunteers provided Five Star Veterans Center with the ability to house three more veterans. 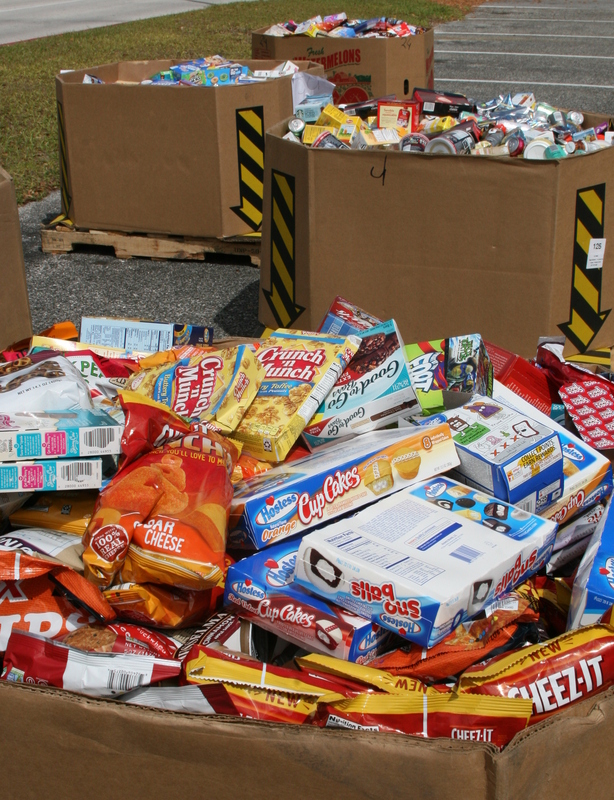 Volunteers moved more than 7,000 pounds of food for community members who receive assistance through Feeding Northeast Florida. 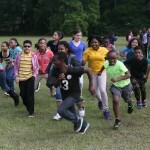 More than 100 trees were planted in the Arlington Community (project partners- Jax Parks, Greenscape, JEA). Volunteers planted 50 native shrubs and weeded the entire Arlington Community Garden at Tree Hill Nature Center in preparation for the annual Joseph A. Strasser Butterfly Festival. 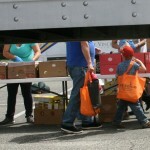 In front of campus in the Gooding Building parking lot, members of the community in need moved among mobile units from three providers: Feeding Northeast Florida, St. Vincent’s Healthcare and the Jacksonville Humane Society. 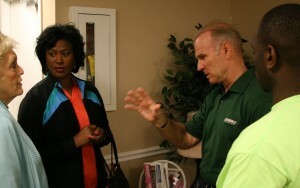 Brigadier Gen. (Ret) Michael Fleming (right), Chief Government, Military and Community Relations Officer, speaks with District Councilwoman Joyce Morgan and Five Star Veterans Center managers. 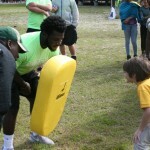 JU’s Fleming said the record participation shows the University has woven itself into the fabric of the community. 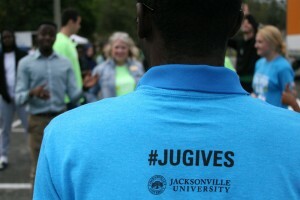 This year, JU decided one day wasn’t enough to celebrate its anniversary, so it expanded festivities into a full Charter Week 2016. 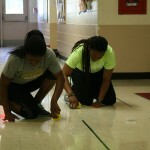 In addition to volunteer projects as part of the week, students, faculty and staff enjoyed Wild West-themed fun, including movie night, square dancing, mason jar decorating and more. 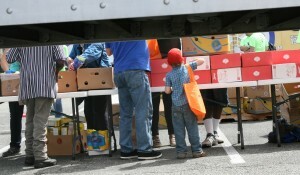 Other events over the week included a food drive and distribution, special Eli Young Band concert, a Brooks Rehabilitation College of Healthcare Sciences Distinguished Lecture by Exercise Is Medicine global founder Dr. Bob Sallis, a Global Toast and a TedX Salon on the topic of aging. Dr. Wenying Xu, Provost and Chief Academic Officer, said the day’s events served to open students’ eyes beyond academic studies. “As I planted trees this morning and saw all these students around me as we helped beautify our Arlington parks, I realized so clearly that we aren’t just teaching our students in class, but teaching them about their responsibilities in the community,” she said. Rosa Gyuris, Academic Affairs, helps paint stenciled figures on the hallway walls at Arlington Heights Elementary School on Charter Day. 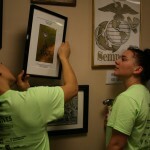 At Five Star Veterans Center, students helped move furniture, reorganize rooms and decorate hallways. Sophomore Blaz said veterans often feel isolated and ignored by their fellow citizens. Down the hall from Blaz, Councilwoman Morgan watched as a group of JU students moved a mattress into a veteran’s new room. Skipton, the Phys. Ed. teacher at Arlington Heights Elementary, watched as a student hit a blocking pad twice his size, held up by a Dolphins football player who encouraged him on. 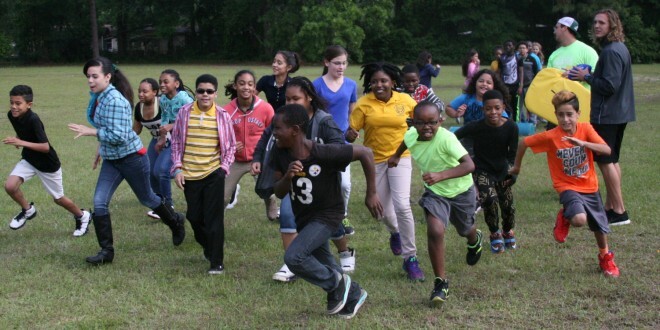 Then she smiled as the exuberant group of kids waiting their turn in line broke ranks and charged back across the field as Coach Shields blew his whistle to signal time to rotate to the next drill. Food gathered during JU’s Charter Week 2016 drive to help the needy. 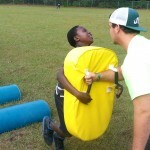 “I can’t express how this means the world to all these kids. They don’t get exposed to this type of thing, being with these JU students here and working with them as role models,” she said. 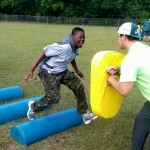 “They can see how they can continue their education, play sports … because they can identify with the players and see what they’ve become. 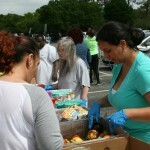 JU had faced a perception that it’s not the part of Arlington it could be, said photo project participant Galdona, as she clicked away in the Gooding parking lot while newly accepted students bustled about, handing out food to area residents. 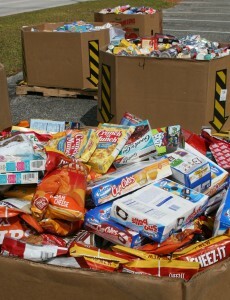 Food gathered during JU’s food drive to help the need during Charter Week.